sabel village 150 meters from the sea near Hors Show with private pool bbq, luxury two terraces and a chill pergola aout meets all feature for holidays desired by anyone, private. Cyril and Isabel were very nice and helpful. The pool was really cool, and I think it was even bigger than it looked in the pictures. Very short distance to the beach, but for a bigger supermarket (like LIDL,Mercadona etc.) it was a quite long way by foot. About Oliva in general: We were 15 people without a car, so it was a bit problem that in Oliva there were only 4 taxes in the whole town and not big taxes at all. 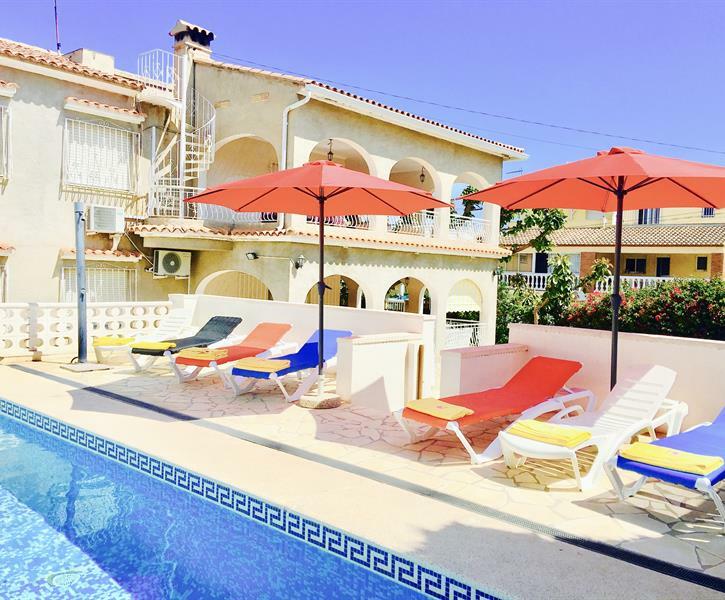 The villa and location were excellent for our needs, a family of 12 including four children. The villa had plenty of bedrooms and seating areas inside and outside. We cooked every night, mostly BBQ. The beach was very close and accessed along a safe river path. Good supermarket only 5 minutes away. A local castle and harbour to visit and excursions were made to nearby Denia and for the more adventurous ones, Valencia. Our hosts, Cyril and Isabella were most helpful and pleasant. Everything went smoothly, a wonderful stay. We enjoyed our stay at villa Isabel. The house was clean and we had enough space for 16 people. Cyril and Isabel always reacted quickly if we had questions. They even arranged some drinks and snacks when we arrived very late at the villa. The swimmingpool is bigger than what you see on the photos. The beach is very close by and beautifull. Fantastiskt hus med stora sällskapsytor både ute och inne. Huset har en egen fin pool och det är bara några minuters promenad till den fina stranden. Värdparet tog hand om oss på bästa sätt.